I would have a hard time working without the Pandas library at this point. I spend a lot of time munging and anayzing tabular data, and pandas is a critical part of my workflow. I wanted to quickly demonstrate a couple small pieces of code from my side project climatic that show the relative power of pandas, then dive into the guts of what's happening behind the scenes. 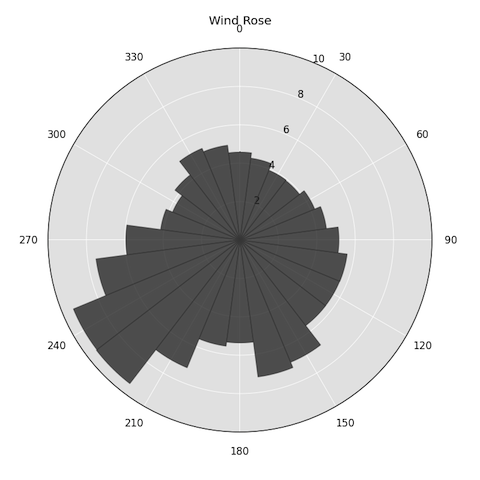 If you are interested in tinkering with the data used in this example, see the examples folder in the climatic repo. There are a couple example scripts in there as well that outline how to use climatic to manipulate the data. np.digitize is doing our heavy lifting, by bracketing our x value in the bin. The kwargs are necessary in order to address the edge case where x and the max bin are the same, and thus to include it we need to set right=True in np.digitize. >>>map_bin(360, freq_bins) #Edge case works! Ahhhh the magic of Pandas.